There is one instance in the Freeh Commission report where Graham Spanier, the disgraced former Penn State president, said enough is enough. One instance when he slammed down his authoritative fist to protect the welfare of his charges and the reputation of his institution. It wasn't against Jerry Sandusky, of course. It was December 1997 and Spanier was soon to learn that the longtime Penn State defensive coordinator had been accused of molesting a young boy while showering with him in the Penn State locker room, according to the Freeh report. But Spanier wouldn't stand up to old Jer, because that wouldn't be the "humane" way of handling it. Or so he wrote in an email. No, Sandusky got to keep fondling right under Spanier's nose for years to come. That was a pardon not shared by star Penn State running back Curtis Enis and professional sports agent Jeff Nalley, who dared violate the document that directed Spanier's moral compass, the NCAA rulebook. Enis was immediately declared ineligible, and cited as a stain on Penn State's so-called "grand experiment" of creating a healthy balance between academics and athletics. The agent, meanwhile, was reported to the NCAA and the local district attorney, banned from ever setting foot on Penn State's campus ("persona non grata" Spanier declared), charged with a crime and publicly shamed by the president himself so everyone understood the evil and danger he represented. 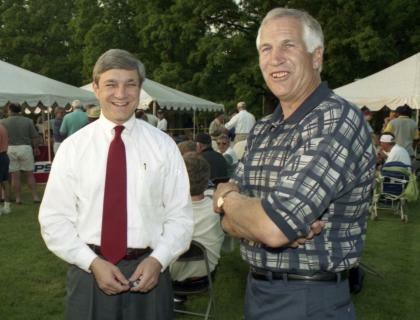 "He fooled around with the integrity of the university," Spanier said at the time, according to the Freeh report. "And I won't stand for that." If fooling around with kids in the showers was something Graham Spanier could apparently stand for, then what was Enis and Nalley's crime against humanity? It was a nice suit, $325 retail at a Harrisburg clothier. There was a $75 shirt too. Enis was slated to appear on an ESPN awards show and didn't have anything that nice to wear. The regular season was over and he was about to declare for the NFL. Nalley sprung for the outfit. Spanier saw it differently. Since Penn State still had one game remaining, essentially an exhibition in the Citrus Bowl, he dropped the hammer. Victim No. 2 of Sandusky's crimes apparently wouldn't mean much to the Penn State president, but NCAA Bylaw 12.3 sure did. It's the rule that prohibits players from receiving "benefits" from agents. Even if the so-called benefit was appropriate attire for a made-for-television show to celebrate the multibillion-dollar industry Enis helped drive. According to the rule book, though, he couldn't be provided a nice suit because, well, because people like Graham Spanier said so. And continue to say so. Spanier may still be indicted for his role in the Sandusky case, just as two of his lieutenants, athletic director Tim Curley and vice president Gary Schultz, already have been. He may wind up serving prison time. In the interim, let him serve as the prime example of NCAA hypocrisy, arguably the single worst administrator to ever try to control, shape and domineer intercollegiate athletics. Spanier was the ultimate NCAA busybody. He sat on and later chaired the organization's Board of Directors, a position arguably more powerful than NCAA president. He was on the high-level NCAA management council. He chaired the BCS Oversight Committee. He was everywhere over the last decade and a half, the epitome of the faceless bureaucrat that churns out all those lopsided NCAA rules and bizarre statutes in an effort to exert an iron grip on the system. The NCAA is often vilified. It isn't the workers at the Indianapolis headquarters who deserve scorn. It's the Spanier types, the presidents and commissioners who write the rules one committee meeting at a time (usually from a Florida beachfront hotel). He was a model of self-interest, distorted ethics and misplaced authority, much of it derived from the false concept that Penn State football operated on a higher ethical level than the rest of the country. "He'd always lean on the Penn State thing," said one administrator who served alongside Spanier on NCAA committees. "He always made the Penn State part known. Like, 'Well, we do it within the rules and still win at Penn State, at Penn State football. Why can't you? Why lower the bar? What's wrong with you?' "
It was a lie and Graham Spanier knew it. Not just in the case of Sandusky. There's plenty more in the Freeh report. Incidents of the athletic department not following its own policies, not reporting potential violations, allowing head coach Joe Paterno's outsized influence on discipline and other issues. For years the school didn't even adhere to the federal Clery Act, which requires reporting crimes committed on campus. Not that it slowed down Spanier. He opposed an endless parade of reforms designed to assist athletes, provide additional support for athletes and even admit athletes to schools. Policies such as Proposition 48, which attempted to tighten eligibility standards for athletes were Spanier's baby (federal courts struck it down). His most recent push was again for stricter admissions standards that coaching and student advocacy groups say will hurt kids from disadvantaged programs and poor performing high schools. Spanier shrugged and pointed to Penn State's "grand experiment." Meanwhile, he routinely railed about outside influences and corruption. He scolded the culture at some programs that didn't take violations seriously. He fought for more and more statutes. He was part of a NCAA movement to criminalize the behavior of agents. He looked to eradicate anyone trying to provide representation to high-value athletes, even arguing that an agent should be kept "away from current graduates or students whose eligibility has recently expired," a patently absurd stance. The NCAA, and only the NCAA, should control everything. The NCAA rulebook is deeper than that, of course. It also has considerable economic power. By creating a system that strictly polices amateurism, colleges are allowed to claim they operate amateur sports – just your average Pop Warner team – and thus avoid paying the players and taxes, a billion-dollar dodge. "I think it opens up a window into the psyche of some of the people who run college sports," said Ramogi Huma, president of the National College Player's Association, a California-based advocacy group for student-athletes. "They use ethical arguments that create hardship for the people they are supposed to be protecting to actually mask unethical behavior." Everything with Penn State is in question now. That sterling graduation rate? The culture of compliance? Is anyone still so naïve they think a crew that would look the other way on Sandusky wouldn't ignore a little aggressive tutoring or a lost drug test or three? Maybe it was the Miami Hurricanes who wore combat fatigues, in contrast with Penn State's coat and tie approach, before their famed 1987 Fiesta Bowl matchup, but you still want to believe that over the years the two schools were all that different when it came to breaking rules? Do you still believe anyone is? Spanier needed that illusion, though. He needed it desperately because that had become his identity. It was more important than for Paterno, who did far less moralizing. Paterno defended Barry Switzer and any number of supposed "outlaw coaches" through the years. Not Spanier. He had to crush those guys. He didn't just want to run Penn State athletics. He wanted to determine how every other school ran its athletics. "A lot of things have reached a boiling point," Spanier told ESPN last August after a string of rampant rule-breaking caused the NCAA to hold a summit to tighten the reins. Of course, if the scandals revealed anything, it was that so few coaches, administrators and players respect the rules Spanier helped draft in the first place that they think this stuff is absurd. When Spanier didn't report Jerry Sandusky, he said it was the "humane" way to go. When Ohio State coach Jim Tressel didn't report that some of his players got free tattoos, Spanier believed a boiling point had been reached. So as we await formal charges, let Graham Spanier forever be the poster boy for NCAA arrogance, hypocrisy and miscast power. Let him be the face of all the organization does wrong. Perhaps we can use his mug shot.